The gap between rich and poor is reaching new extremes. Credit Suisse recently revealed that the richest 1% have now accumulated more wealth than the rest of the world put together. This occurred a year earlier than Oxfam’s much publicized prediction ahead of last year’s World Economic Forum. Meanwhile, the wealth owned by the bottom half of humanity has fallen by a trillion dollars in the past five years. This is just the latest evidence that today we live in a world with levels of inequality we may not have seen for over a century. Apologists for the status quo claim that concern about inequality is driven by “politics of envy”. They often cite the reduction in the number of people living in extreme poverty as proof that inequality is not a major problem and that globalization has delivered huge progress. But this is to miss the point. As an organization that exists to tackle poverty, Oxfam is unequivocal in welcoming the fantastic progress that has helped to halve the number of people living below the extreme poverty line between 1990 and 2010. Yet had inequality within countries not grown during that period, an extra 200 million people would have escaped poverty. That could have risen to 700 million had poor people benefited more than the rich from economic growth. Central to this is the nature of globalization, and the type of economic forces that have driven it. During the era of globalization, Oxfam’s research has shown that the average annual income of the poorest 10% of people in the world has risen by less than $3 each year in almost a quarter of a century. Their daily income has risen by less than a single cent every year. There is no getting away from the fact that the big winners of globalization are those at the top. Our economic system is heavily skewed in their favour, and arguably increasingly so. Far from trickling down, income and wealth are instead being sucked upwards at an alarming rate. Once there, an ever more elaborate system of tax havens and an industry of wealth managers ensure that it stays there, far from the reach of ordinary citizens and their governments. One recent estimate is that $7.6 trillion of individual wealth – more than the combined gross domestic product of the UK and Germany – is currently held offshore. Instead of an economy that works for the prosperity of all, for future generations and for the planet, we have instead created an economy for the 1%. So how has this happened, and why? One of the key trends underlying this huge concentration of wealth and incomes is the increasing return to capital versus labour. 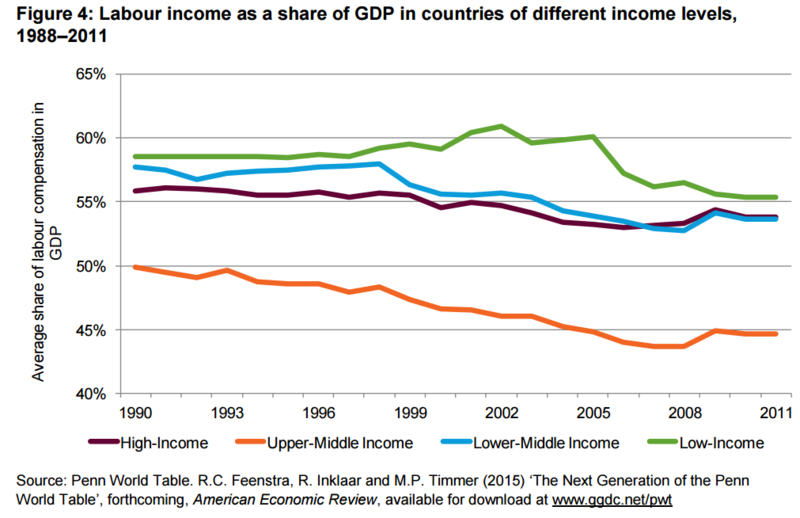 In almost all rich countries and in most developing countries, the share of national income going to workers has been falling. This means workers are capturing less and less of the gains from growth. In contrast, the owners of capital have seen their capital consistently grow (through interest payments, dividends, or retained profits) faster than the rate the economy has been growing. Tax avoidance by the owners of capital, and governments reducing taxes on capital gains, have further added to these returns. As Warren Buffett famously said, he pays a lower rate of tax than anyone in his office, including his cleaner and his secretary. Within the world of work, the gap between the average worker and those at the top has been rapidly widening. While many workers have seen their wages stagnate, there has been a huge increase in salaries for those at the top. Oxfam’s experience with women workers around the world, from Myanmar to Morocco, is that they are barely scraping by on poverty wages. Women make up the majority of the world’s low-paid workers and are concentrated in the most precarious jobs. Meanwhile, chief executive salaries have rocketed. 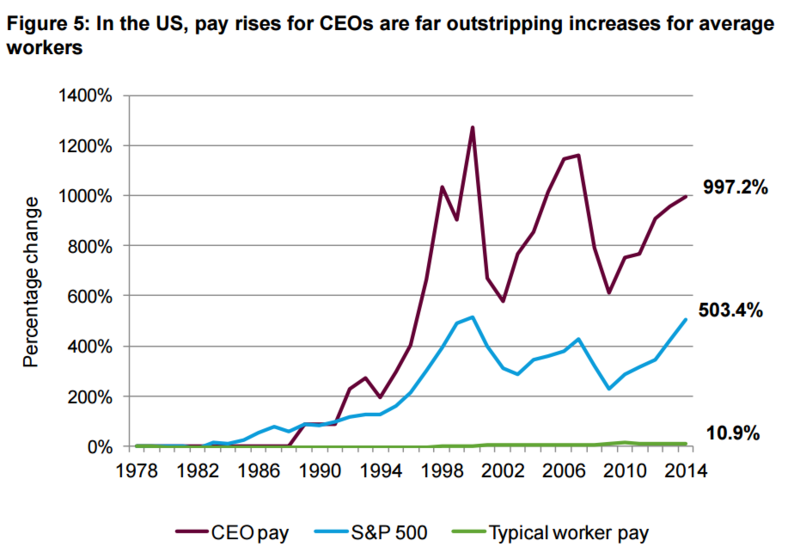 CEOs at the top US firms have seen their salaries increase by more than half (by 54.3%) since 2009, while ordinary wages have barely moved. The CEO of India’s top information technology firm makes 416 times the salary of a typical employee there. Across the global economy, in different sectors, firms and individuals often use their power and position to capture economic gain for themselves. Economic and policy changes over the past 30 years – including deregulation, privatization, financial secrecy and globalization, especially of finance – have supercharged the age-old ability of the rich and powerful to use their position to further concentrate their wealth. This policy agenda has been driven essentially by what George Soros called “market fundamentalism”. It is this that lies at the heart of much of today’s inequality crisis, and has underpinned globalization. This word view is also known as neoliberalism, and has recently also been identified by the IMF as having been a significant driver of inequality. A powerful example of an economic system that is rigged to work in the interests of the powerful is the global spider’s web of tax havens and the industry of tax avoidance, which has blossomed over recent decades, as a direct result of the globalization of finance. It has been given intellectual legitimacy by the dominant market fundamentalist/neoliberal world view that low taxes for rich individuals and companies are necessary to spur economic growth and are somehow good news for us all. The system is maintained by a highly paid, industrious bevy of professionals in the private banking, legal, accounting and investment industries. It is the wealthiest individuals and companies – those who should be paying the most tax – who can afford to use these services and this global architecture to avoid paying what they owe. It also indirectly leads to governments outside tax havens lowering taxes on businesses and on the rich themselves in a relentless race to the bottom. As taxes go unpaid due to widespread avoidance, government budgets feel the pinch, which in turn leads to cuts in vital public services. It also means governments increasingly rely on indirect taxation, like VAT, which falls disproportionately on the poorest people. Tax avoidance is a problem that is rapidly getting worse. This is just one example of the dark side of globalization, that has driven rapidly rising inequality in country after country, based on an economic system that has benefited the few at the expense of the many. For Oxfam, there is no doubt that globalization has delivered tremendous progress in terms of reducing extreme poverty, but at a very high cost in terms of rapidly increasing inequality, and the neoliberal economic system that underpins it is deeply inefficient and ultimately unsustainable. There is an urgent need to design a new economic system, a more human economy. A human economy which puts the needs of the majority first, to build a more equal and more sustainable world. Have you read? 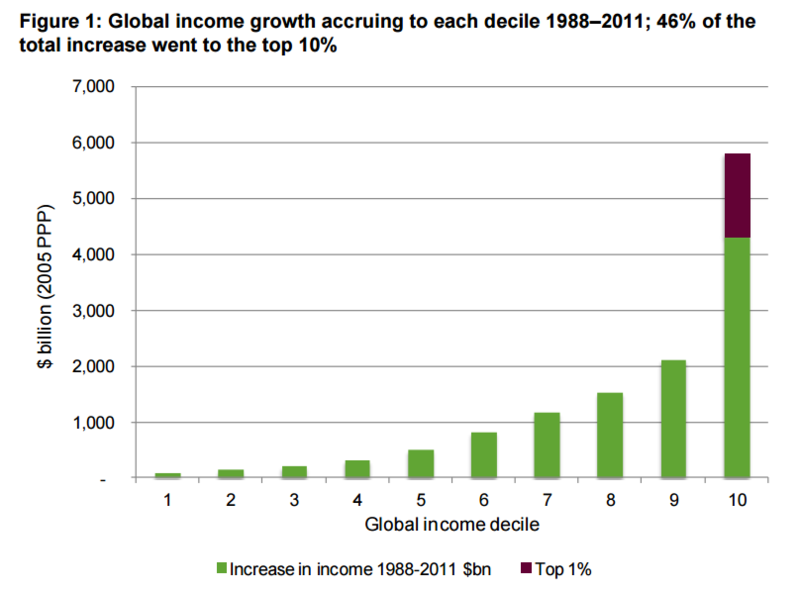 Globalization for the 99%: can we make it work for all? Let’s ditch the economy of the 1% and replace it with a human economy There’s never been a better time to be alive. So why the globalization backlash?